1H and 13C NMR and fluorescence quenching spectrometry clearly indicate that this complex is formed when CPP is mixed with C60 in toluene. 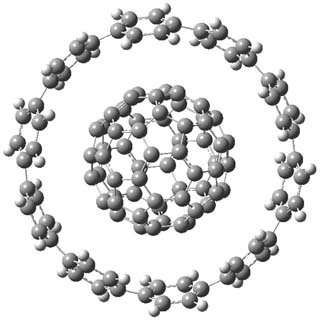 In fact, when C60 is mixed with a mixture of nanohoops ranging from 8 to 12 phenyl ring, only the CPP hoop complexes with the fullerene. The experimental binding energy is between 38 and 59 kJ mol-1. M06-2x/6-31G* computations give the structure shown above. The computed binding energy is 173 kJ mol-1, but the computations do not include solvent. So this overestimation might be somewhat due to the difference in gas phase vs. solution complexation. As you say Steve, a lovely molecule. Can I clarify one aspect. The article mentions that CPP and C60 are stabilised by about 38 kJ. This seems to come from binding constant measurements, and so we may take it to be a Gibbs free energy. Likewise, the activation energy for the exchange reaction is a free energy obtained by the coalescence temperature in the NMR spectra. However, the calculation reported claims to be an enthalpy (actually, its not even that, since I think it does not include any zero-point energy thermal corrections). Since we are dealing with loss of degrees of freedom resulting from encapsulation, enthalpies and free energies must be related by an evaluated entropy. I notice that many an article reports energies whilst being rather vague about whether they are enthalpies, free energy, binding or activation energies (Eyring or otherwise).